The only long distance, migratory butterfly in the world is the monarch butterfly of North America. Starting in the northern reach of their range, the monarch begins migration in Canada in late August. 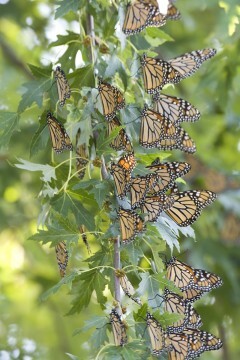 By mid-September the monarch migration reaches the Kansas City area. Peak migration is usually right around the fall solstice in our area. The big front from the north that pushed through on September 18 brought the first real wave of migratory monarchs into Missouri and Kansas. Monarchs can migrate 25-30 miles per day and migrate only during daylight. In comparison, birds migrate an average of 75-125 miles in a 24 hour periods and many migrate at night. From the northern part of their range in Canada, the trip to the overwintering grounds in the Mexican Monarch Butterfly Biosphere Reserve can be over 3,000 miles. During fall migration monarchs will cluster at night. This behavior continues once they reach Mexico. It is a way to stay warm in the Oyamel trees in the Mexican forest. The cluster pictured here has been going on during migration for at least 5 years about 30 miles SW of Kansas City. 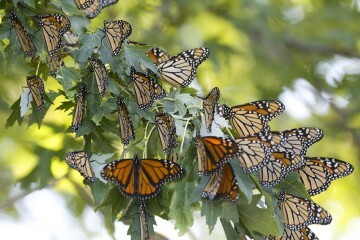 In typical years the migrating monarchs will be through Kansas City by October 4. After the first week in October, it will be late April or early May before any Kansas Citians see monarchs in the area. Success of increasing monarch populations is gaged by surveying the area covered by the overwintering monarch population in Mexico. In 2013/2014 they hit an all time low of .67 hectacres, approximately 33 million butterflies. Last year the prediction was 100% increase. The number came in short at 1.13 hectacres or approximately 57 million butterflies. The hope is for a good bump this winter. Chip Taylor from Monarch Watch is predicting 1.8-2.3 hectacres. An improvement but we still have work to do. The threshold for a population that can withstand a catastrophic winter storm is 4+ hectacres. We look forward to seeing an increase in the overwintering numbers that will come out in March. All the work being done to plant milkweed and native nectar plants is hopefully paying off. Thank you to everyone that came to the Burroughs Fall Plant Sale at the Backyard Bird Center or the Wings Over Weston free milkweed and nectar plant give away at Monarch Mania, Anita B. Gorman Discovery Center, last weekend. Native plants help all butterflies, moths and birds! Look for an announcement this winter of our native plant sales next year! While you are out enjoying fall bird migration, for the next week take some time to notice the monarch migration as well!